The course of the Grand River provides an excellent habitat for many rare, threatened, and endangered species in Ohio. 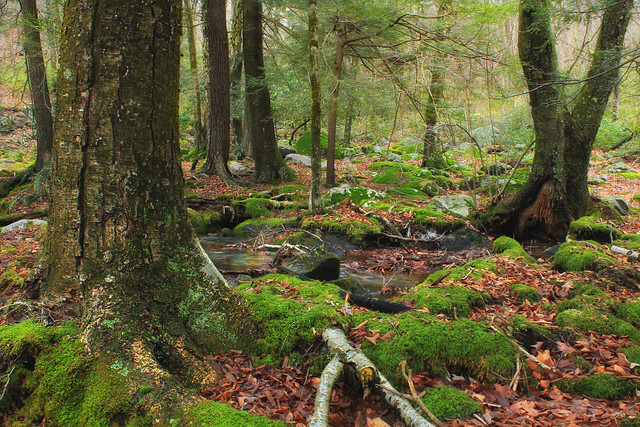 The beautiful hemlock forests found in the lower portion of the watershed are critical to most of these species’ survival. The woods are located in ravines along the river’s tributaries, where the steep valley walls of the Chagrin Shale help to preserve the wilderness and minimize human development. As a result, the hemlock ravines are able to provide a habitat to animals and plants traditionally found in colder climates. However, these unique pockets of flourishing biodiversity have recently found themselves under significant environmental attack. The main threat to the well-being of this area is anthropogenic contamination. 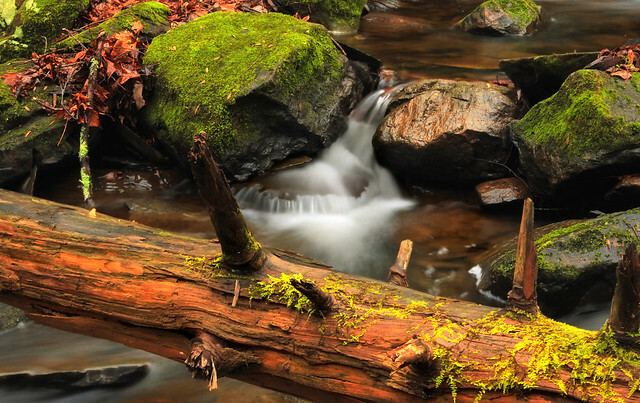 Particularly worrisome is fragmentation, a process that creates siltation (the pollution of water by fine particulate materials), which may have devastating effects on the streams that nourish these lush hemlock ravines. Nearby housing projects pose a variety of issues, including pesticide usage by homeowners, habitat loss, and the placement of utility lines with drainage into the river. Dirty runoff water flows continuously. The watershed holds an old Diamond Shamrock industrial site, which the Ohio government considers to be highly polluted. Runoff pollution from this site, in addition to nonpoint source pollution and sewer waste, threatens the integrity of the Grand River and surrounding areas that depend on its health. The Eastern Hemlock is native to Ohio. They have become a popular landscape tree within cities, and are now found mostly in the urban areas. 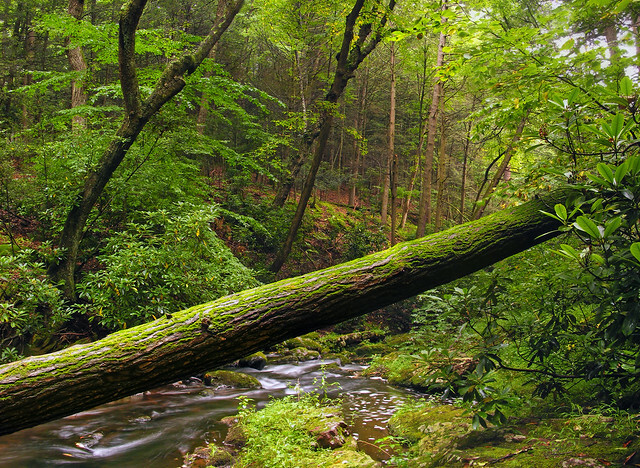 Wild hemlocks thrive on the northern slopes of hills and mountains, or tucked away in deep ravines. These conditions provide shade, cooler temperatures, and abundant moisture. The individual trees vary in size, but an average Eastern Hemlock will ascend to 70 feet, with a 35-foot spread. Under optimal conditions, the measurements may double, whereas smaller trees in urban areas will struggle to survive. The Ohio Department of Natural Resources recognized the unique vitality of the hemlock ravines, and reintroduced wild turkeys, snowshoe hares, and river otters. Local forest-nesting birds find shelter there, as do some northern breeders, and together they draw crowds of birdwatchers. Unfortunately, several species face precarious futures; among them are the black-throated green warbler, Canada warbler, Canada buffalo-berry, cow-wheat, dark-eyed junco, and hermit thrush. Various plant species also fall on that list: flattened wild oat grass, magnolia warbler, riffle snaketail, solitary vireo, round-leaved dogwood, sweet-Indian plantain, mussel beds, Uhler’s sundragon, winter wren, and the beech-sugar maple forest. Invasive species flourish along the watershed corridor, including garlic mustard, buckthorn, phragmites, purple loosestrife, Japanese knotweed, and reed canary grass. These plants exhaust the natural resources needed to support the hemlock groves. The Nature Conservancy and other environmental groups are currently working to protect the Lower Grand River Watershed and the hemlock ravines from environmental degradation. Their efforts include restoring wetlands, purchasing land, and studying the factors that affect stream health. Furthermore, the Cleveland Museum of Natural History, with the support of local county governments, is advancing the need for habitat conservation within the watershed to combat the danger to the hemlock ravines. Hopefully, as a result of these efforts, the Lower Grand River Watershed will experience less erosion and flooding, have cleaner water, and be able to provide a better habitat for terrestrial and aquatic species in the hemlock ravines.